Clean & Sober Transitional Living(CSTL) a long-term recovery housing program that has enjoyed tremendous success with men and women alcoholics seeking long-term sobriety. Our fees are some of the most competitive in the industry. Our program embraces Alcoholi's Anonymous and Narcotics Anonymous and requires residents to be active members in those programs. We are a network of 14 beautiful homes that function as a community. A community offers more due to the quantity of people, the fellowship and therapeutic aspects that naturally exist. The residents themselves reinforce their recovery through support with other recovering persons. Our residents become a member of the community and are held accountable. Residents must agree to abide by the rules and expectations, be a member of a 12-step program, attend a minimum of four 12-step meetings a week and obtain a sponsor. Attendance at a Sunday evening house meeting is mandatory. They must agree not drink or use drugs and conduct themselves in a manner that is conducive to recovery. Violation of these conditions could mean an appearance before a Peer Panel (Judicial Committee) resulting in consequences and/or termination. We test for drugs and alcohol at random and we have a written policy dealing with resident's use of alcohol or other drugs. A person never knows when they will be selected to submit a urine sample for urine analysis. If a person is toxic, their contract is terminated immediately. We are willing to do an intervention on someone who is honest about his or her drug or alcohol use. They must be in agreement to go through a process that involves presenting a detailed relapse prevention plan to the Peer Panel. If they are willing to accept the consequences the panel may hand down; they are likely to be able to return as a resident upon testing clean. Residents are encouraged to be employed or in school. There are junior colleges, California State University and various trade schools in nearby proximity. Personal success is achieved by the person through "doing and experiencing" real life where they develop self-esteem and regular living patterns. After a resident's initial week, they are allowed to have up to 2 nights pass every 7 days away from CSTL. Many residents take advantage of their "passes" to spend quality sober time with their families and friends. We developed and practice a two phase approach to sober transitional living. All new residents start out in Phase I. Phase I is comprised of 6 homes all located on the "Main Block" along with our administrative center. Bedrooms are shared by 2 residents. Please refer to KEY BENEFITS – PHASE I for detailed information. After a period of one month and availability, residents may apply for Phase II housing. Phase II consists of 11 neighboring homes all within short proximity of the "Main Block". Rooms are single occupancy at a very competitive rate. Please refer to KEY BENEFITS – PHASE II for detailed information. 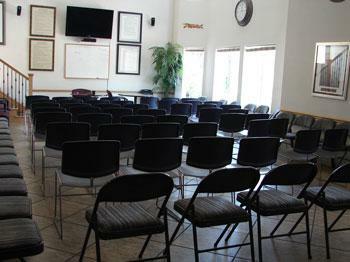 Daily 12-Step meetings are conducted in the meeting room of the Main House. These meetings are open and attended by residents and non-CSTL residents. Big Book Studies and Bible Classes are also available. There are a number of outside 12-Step meetings within a few mile radius of CSTL. Many residents car-pool to these meetings. If needed, we can refer a nearby detox facility. For residential or intensive outpatient treatment, we refer to Clean & Sober Recovery Services, which is less than a mile away. We are certified with California Association of Addiction Recovery Resources (C.A.A.R.R.) as a Sober Living Environment and we are highly respected in the field.